Sticky Labels Blog | Business Labels | Where Can I Get My Business Stickers Printed: FAST? We understand that the world of business moves very quickly and that it’s important when a decision is made that it’s acted upon rapidly. If for example, you need business stickers printed you want them with you as soon as possible and you need a company to print them that won’t sacrifice quality for speed and can guarantee their delivery. We’ve studied our market and noticed that many of our competitors can only offer a turn-around of 4 to 7 days. What this means is, you place an order with them and have to wait nearly a week for the labels to be with you. We don’t think this is good enough. For that very reason, we ensure that not only do we produce the very best quality sticky labels available (We NEVER compromise on quality!) but that we have them printed and dispatched within 2 working days: guaranteed… As standard. We have invested heavily in ensuring that our service is the best out there for business users by regularly upgrading/updating our printing machines, the software we use, the website you order from and how our business practices work. We’ve been in the industry for over 40 years and still value every client (old and new) with the values instilled from the early days. We know you want the order with you quickly and we also know that you’ll come back in the quality, service and price are right. Every order that we receive is printed within two working days and dispatched so it should be with you within 3 working days. We don’t take shortcuts: We just know our job! Another service that will provide you peace of mind is the delivery. Unlike other sticker printing companies we do not mislead you by showing the lowest possible price on the labels: We include the delivery price and the VAT so there are no nasty surprises at the checkout. We know how irritating it is when you upload your design, spend time creating the right label and see a price that you keep in mind, only to have a whopping postage charge added one at the last moment. 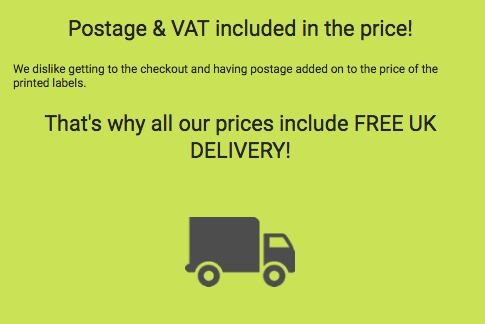 We’ve had people in the past say that we seem expensive but when we point out that 2-day dispatch and postage is inclusive in the price it suddenly seems a lot cheaper! We know how we want to be treated when we commit to placing an order with a company and that is exactly how we want to look after our customers. It’s also the only way to see repeat business: If you’re happy, you’ll come back again! Sometimes, you need printed labels for you that little bit faster. We understand that. If you require your labels the very next day and cannot afford to wait then we do offer priority service to ensure you get the stickers in time. You can choose this service at the checkout and though there is a small additional charge, we make sure that your order is at the top of the queue and we’ll make arrangements for super-fast next day postage. If there is a tight deadline to meet, the Sticky Labels team won’t let you down. When speed and quality are the criteria that you absolutely have to meet, we have got your back. So next time you look at placing an order with a company that prints stickers, just make sure that you know what they charge for the postage and how long you can expect to wait for the labels to be with you. We’ve been printing for over 40 years and it’s largely thanks to the quality and speed of service that we provide our customers. If you need cannot compromise then you simply cannot afford to go anywhere else! … So give us a try!